Participants gather in a circle for an open discussion during the Forum in San Pedro Columbia. 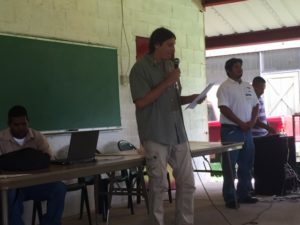 On 20th July 2017, the Belize Foundation for Research & Environmental Education (BFREE) along with Ya’axché Conservation Trust hosted the first Belize Cacao and Agroforestry Forum, entitled “The Future of the Cacao industry in Belize,” at the Church of the Nazarene Medical and Education Center in the historic village of San Pedro Columbia, Toledo District. The Forum brought together nearly 50 participants representing the NGO community, cacao farmers, community leaders, and government representatives in what proved to be an extremely positive event. Located near the Bladen Nature Reserve in Toledo, BFREE has been hosting and sponsoring workshops, symposiums, and forums to promote the conservation and maintenance of Belize’s rich biodiversity, its tropical forests, watersheds and abundant wildlife for the last 25 years. This forum took shape in response to our current research and work, which focuses on using cacao-based agroforestry as a way to expand the edges of rainforests and protect the wildlife who inhabit the area. The Forum had two primary goals; bring together a group of stakeholders in order to share information, discuss challenges and explore opportunities for collaboration and compile information regarding the cacao industry in Belize for inclusion in a regional cacao website, CocoaNext, which will be launched later this year by the Cocoa Research Centre at the University of the West Indies in Trinidad and Tobago. Forum goals were achieved as information was shared and opportunities for collaboration were considered. The group represented an exceptional diversity of experts with a wide breadth of knowledge and experience representing in Belize’s cacao industry making for focused and informative discussions throughout the day. With the success of the Forum behind us, participants are already looking forward to the future. 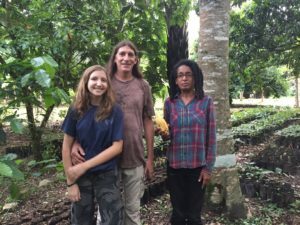 The shared desire resonated – that Belize and, particularly Toledo, will continue to become an important player in the local, regional and world Cacao Market and that this growing industry will benefit local farmers, local businesses, Belize’s economy, and most importantly future generations. 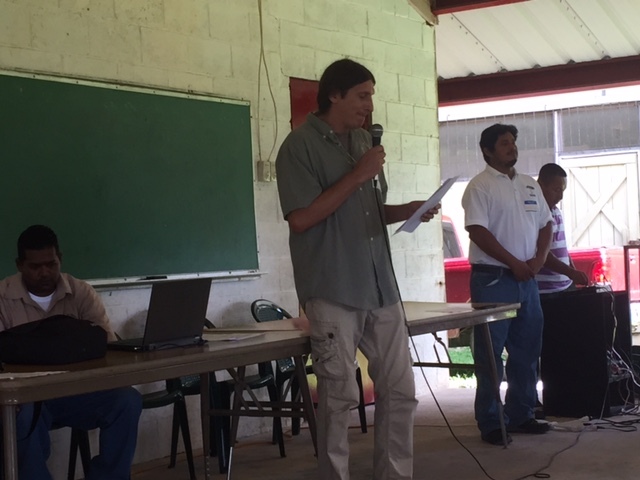 BFREE Executive Director, Jacob Marlin welcomes the participants of the first Belize Cacao and Agroforestry Forum on Thursday, July 20, 2017. • Ms. Antoinette Sankar of the Cocoa Research Centre, at the University of the West Indies, Trinidad and Tobago. Ms. Sankar provided fantastic overview and history of the Cocoa Research Centre as well as need and purpose for the regional cacao website that will be launched later this year. • Mr. Wilber Sabido, Chief Forest Officer of the Belize Forest Department. Mr. Sabido spoke of the Forest Department’s position on cacao and agroforestry. • Mr. Densford Mangar, Ministry of Agriculture Toledo Extension officer. Mr. Mangar presented a national perspective of cacao in Belize. • Mr. Pablo Mes, Program Coordinator for Maya Leaders Alliance. Mr. Mes described traditional Maya lands rights and land use in Belize. 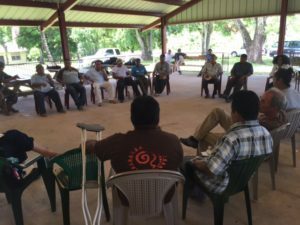 • Mr. Johnson Ical from Trio Village and Mr. Martin Chiquin from Indian Creek Village both provided the group with an overview of a small farmer’s viewpoint. • Mr. Gustavo Requena, Community Outreach and Livelihoods Director of Ya’axché Conservation Trust. Mr. Requena described how agroforestry bridges livelihoods as well as on protected area management and adaptation to climate change. • Mr. Jacob Marlin, Executive Director of BFREE. Mr. Marlin presented how cacao agroforestry may conserve and restore biodiversity. Hyla and Jacob Marlin along with Antoinette Sankar of the Cocoa Research Centre pose for a photo before the Forum in BFREE’s cacao nursery. BFREE would like to thank each of the speakers and the participants for their dedication to a healthy and sustainable future for cacao in Belize. Special thanks also to BFREE Deputy Director, Heather Barrett, BFREE Operations Manager and Cacao Demonstration Farm Manager, Elmer Tzalam and BFREE Board Member, Gentry Mander who helped make the event a success. Funding for the Forum was provided by Belize Foundation for Research & Environmental Education, Ya’axché Conservation Trust, and the US Fish and Wildlife Service, on behalf of the Nyanza Natural Resource Damage Trustee Council – comprised of the Service, Commonwealth of Massachusetts and the National Oceanic Atmospheric Administration. I have written to BFREE previously so kindly accept a somewhat repetitive note. I am advising a U.S.-based NGO on the preservation of neotropical birds migrants through the development of agroforestry along the Caribbean coast of Guatemala. Since these birds spend their non-breeding seasons throughout Central America, it seems reasonable that if the programs in Guatemala are successful they might also be successful in southern Belize. Since BFREE actively promotes the development of agroforestry in southern Belize, and biodiversity appears to benefit from this work, I think that we can learn a lot from Mr. Martin and his colleagues, particularly on how BFREE’s programs benefit birds. I am hopeful that we can begin an email conversation about his programs, our program, possible points of cooperation, including a visit to BFREE in 2018.